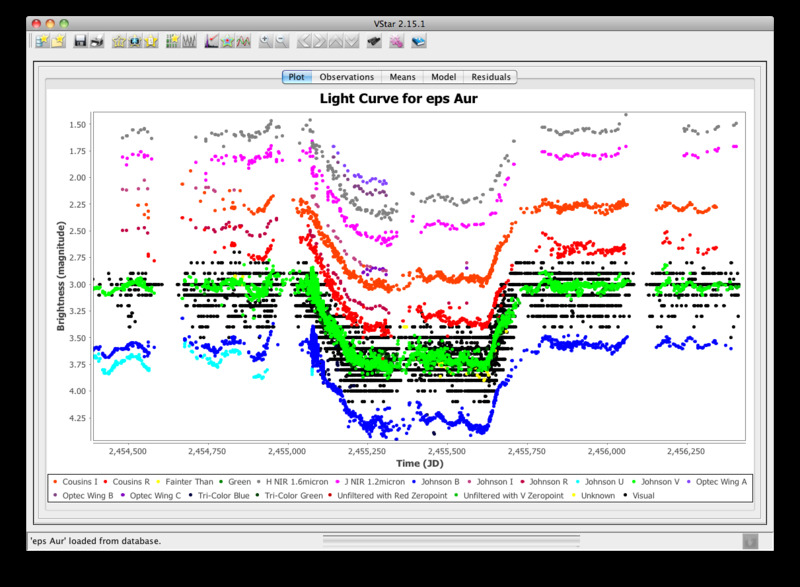 VStar is a multi-platform, easy-to-use variable star data visualization and analysis tool that was originally developed as part of the AAVSO's Citizen Sky project. Data for a star can be read from the AAVSO database or from a text file of your own creation. 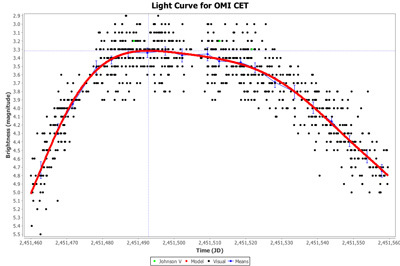 It will plot the data on a light curve and then it's up to you what happens next! To get started using VStar, simply click the blue box below to get the latest version. Clicking the yellow box will download the comprehensive User Manual (9.3 MB). Because VStar uses Java Web Start ™ technology, you will always get the latest version whether you save the start-up icon to your desktop or launch the program directly. You will see a warning dialog box, similar to those presented by other Web-downloaded applications. Click the "Trust" button, in order to launch VStar. Please note that in order to run VStar, you need to have the Java Runtime Environment 1.8 or higher installed. VStar should run on any operating system that supports Java. VStar can also be launched on Mac OS X using a VStar.dmg launcher application. If you have a firewall which blocks connection to the AAVSO server (for access to the AAVSO database) you should either disable it or run VStar offline. To run offline, visit the SourceForge VStar download page and download the latest VStar-(version).zip file, unzip it and place it in the location of your choice on your computer. The ReadMe.txt file contains instructions for running VStar from there. If you have any trouble downloading or running VStar on your computer, please contact Sara (sara @ aavso.org) for help. It will save time if you can provide as much information as possible on your operating system and version of Java you are using along with details of exactly what you see and any error messages you get. 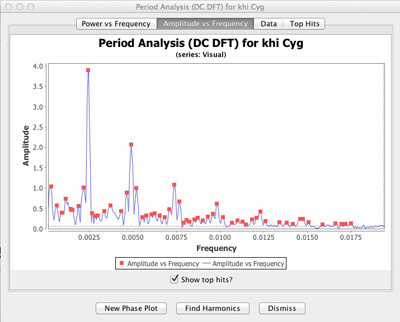 The easiest way to obtain data to plot is by requesting it directly from the AAVSO International Database. To do this, click the “New Star from AAVSO Database…” button in the upper left corner of the VStar screen, then choose a star from the 10-star drop-down list or type in the name of another star from the AAVSO database. 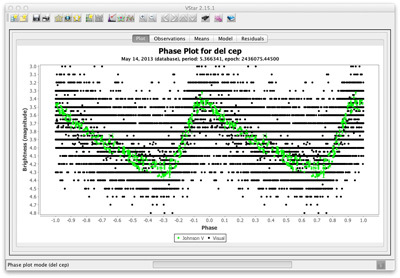 You can change the date range of the plot, use the default range (the last two years worth of data), or select “All data” by clicking the checkbox and hitting “OK”. Other features include the ability to create your own list of favorite stars to view using the "Star Groups" tab under "Preferences" or to filter the data so you can highlight your own observations. If you haven't yet downloaded and read the VStar Users Manual, do so now! (see the yellow box above) This Manual walks you through all of VStar's features and it is recommended that you follow along with VStar itself as you read. There is also an excellent 5-minute introductory video (95 MB) created by VStar CHOICE course graduate George Sjoberg available for download. Another interesting exercise is the 5-Star Data Analysis Tutorial (revised in June 2014 by Paul York). 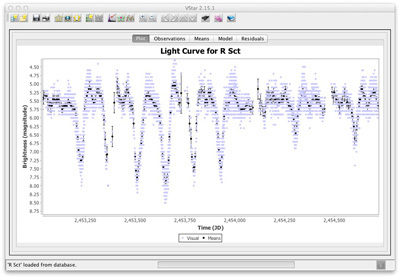 This document will introduce you to VStar by walking you through some of the concepts of basic data analysis. We recommend it as the first place to stop for those new to light curves and variable star data analysis. More help links can be found below. AAVSO VStar forum - Please feel free to post your questions, suggestions, or observations here. AAVSO Data Analysis forum - For discussion of data analysis techniques and projects. 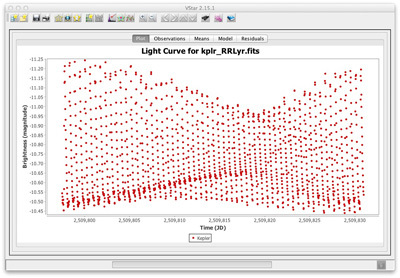 David Benn's VStar blog - Contains good examples of how VStar can be used for data analysis. eJAAVSO article: Algorithms + Observations = VStar - Outline of the development, use and future plans. VStar Video Tutorial - Video created by George Sjoberg (95 MB .mp4). Click here for (90 MB zipped version). VStar is the creation of lead developer David Benn with help from a few volunteers. VStar uses the Apache Commons Math library for anova (F-test, p-value) algorithms. VStar is made available under the Affero GNU Public License, which requires that the source code be made freely available. Click here to visit its Sourceforge site.